I miss snow. Sure, shoveling the driveway ranks up there with washing third-floor bay windows, but building icy forts and sledding right past the edge of safety are among my favorite memories of being a kid. I loved the slow, silent flakes of winter’s first snow, the magic of maple syrup candy, and the crunch of my boots breaking through the late season’s deep crust. The very best, of course, were snowball fights with my sister. Living half a continent away, I’ve had to figure out other ways of sending her my love. White chocolate truffles are not as hard or as cold or as painful as a frosty, well-aimed projectile, but I guess they’ll have to do. The original, quick-and-easy recipe from Gourmet (Dec 2000) skips the whole nuts, the fleur de sel, the excess rum and the butter bath that you’ll find in the recipe below. I obviously like booze, crunchiness and that sweet-salty thing, but both versions are equally yummy. The most important part is to splurge on the best white chocolate you can find. Burlingame-based E. Guittard’s wafers are among my favorites. As you can tell from the yield, this recipe was designed for sharing. Line an 8-by-8-inch pan with plastic film. Select 64 whole nuts and set aside. Pulse the remaining nuts in the processor until finely ground. Heat the cream and 1/4 cup rum in a heavy saucepan over low, swirling occasionally, until small bubbles rise. Remove from the heat, add the white chocolate and stir until smooth, returning the pan to a very low flame if needed to melt the chocolate completely. Stir in the ground nuts. Pour half the mixture into the lined pan and spread evenly. 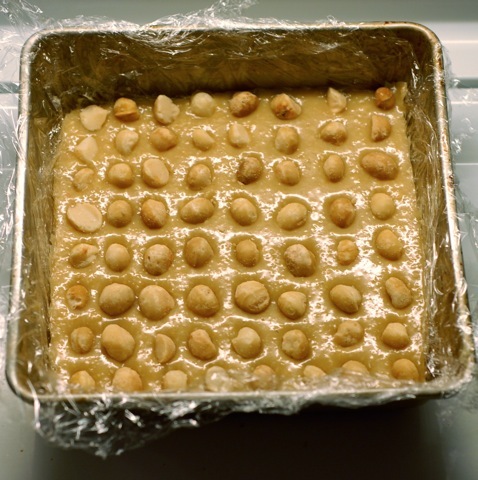 Arrange the whole nuts in an 8×8 grid over the surface of the chocolate. Sprinkle the fleur de sel over the whole nuts. Carefully spread the remaining half of the chocolate over the nuts with an offset spatula. Cover with plastic film and chill until firm, 4 to 6 hours. Invert the chilled chocolate onto a cutting surface. 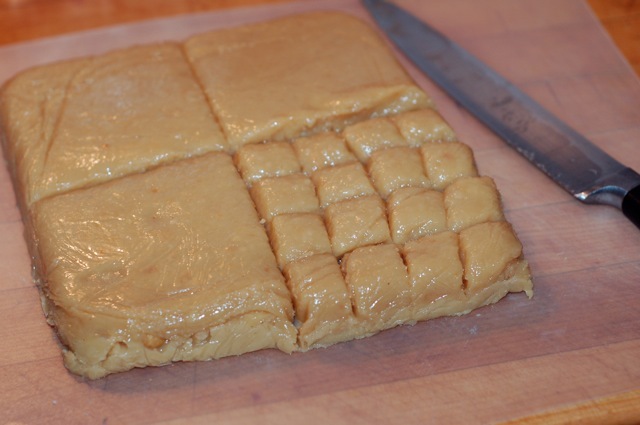 Cut into 64 cubes, centering a whole nut in each one. Roll each chocolate cube into a ball between your palms. After all of the balls have been formed, stir together the butter and remaining 2 tablespoons rum in a small bowl. 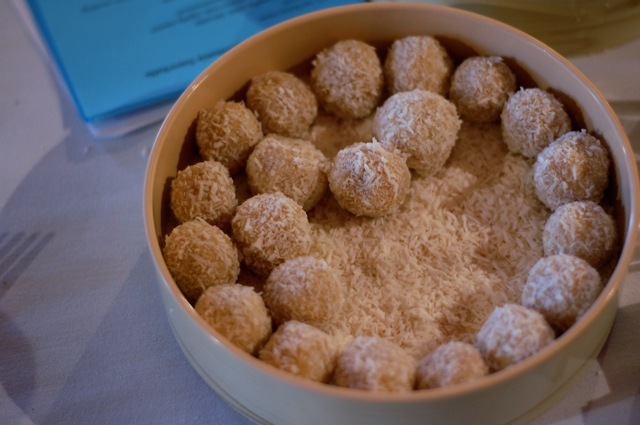 Dip each ball into the rum-butter mixture, and then roll the ball in coconut to coat completely. Chill until firm, letting the truffles return to room temperature before serving.